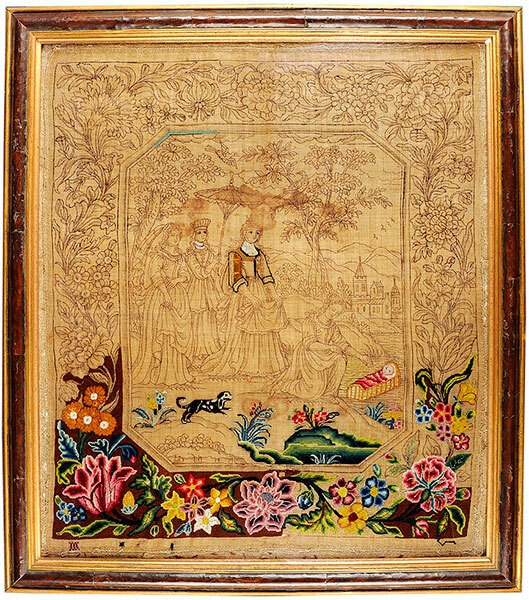 Amongst our important collection of seventeenth century embroidery will be found raisedwork (sometimes referred to as stump work) oftain embellished with precious stones, pearls, beads, spangles and coral, these charming items are highly collected. Other techniques including canvas work and tent-stitch pictures are to be found with both religious (usually old testament) and domestic subjects. Although such objects as coifs, caskets and purses are increasingly rare we aim to have examples of the highest quality. 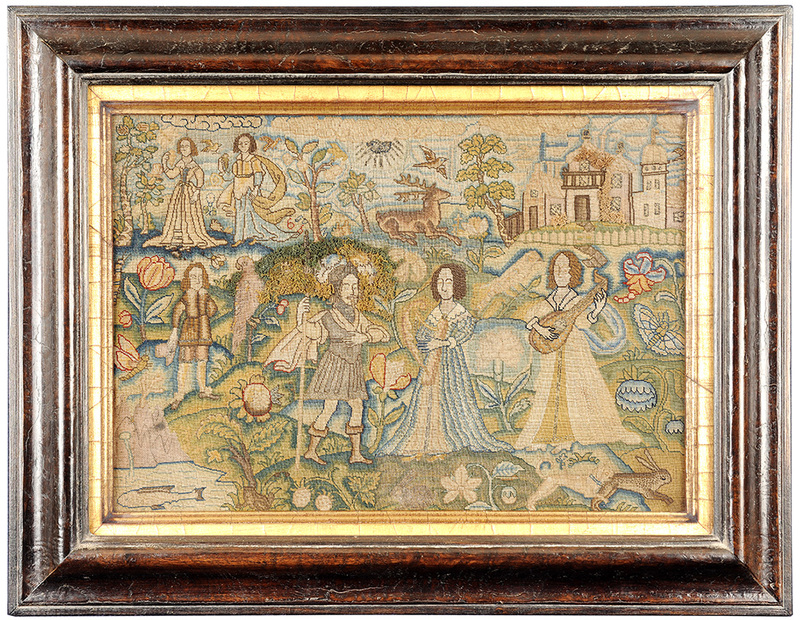 Seventeenth century samplers of spot motif and band form along with white work and black work (Spanish work) may also be seen in the collection. Worked in fine wool and silk threads on an open weave ground. 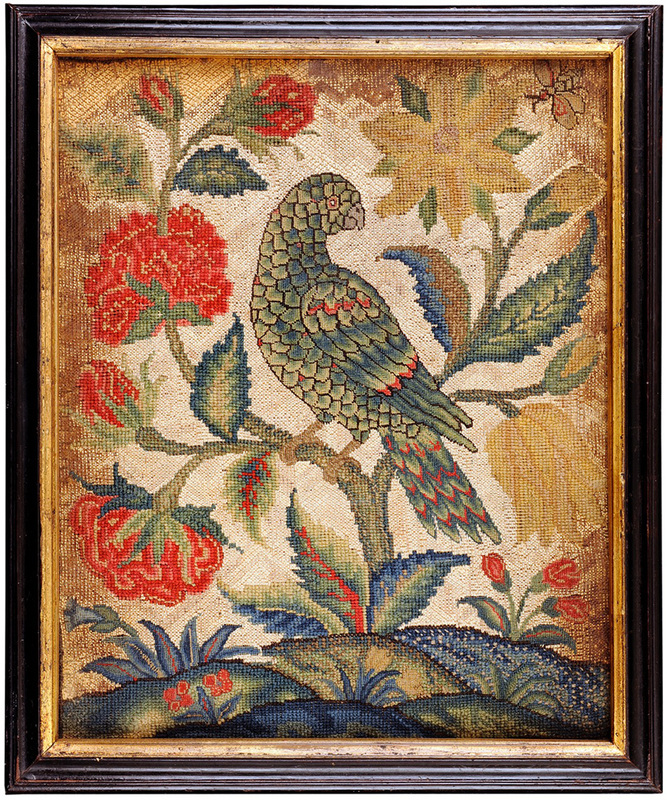 This needlework retains much of its original bright colour. 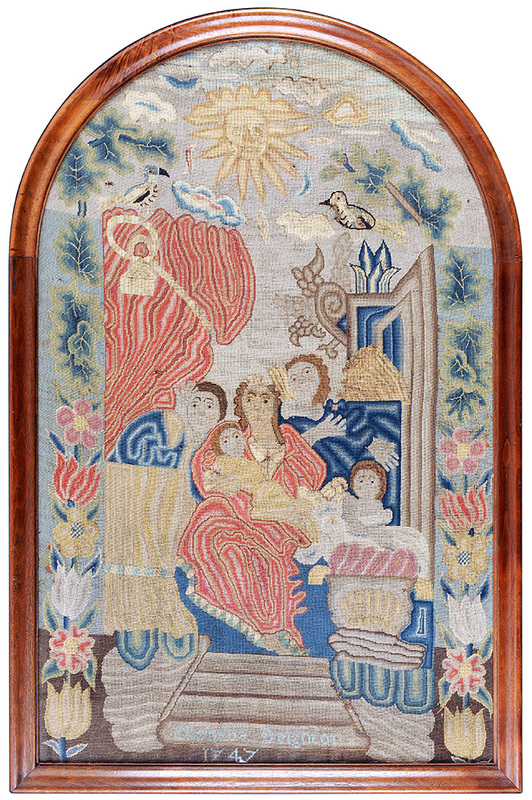 A charming tent stitch mid 18th Century canvas work embroidery depicting Charity holding and surrounded by children Over head the sun shines through clouds. 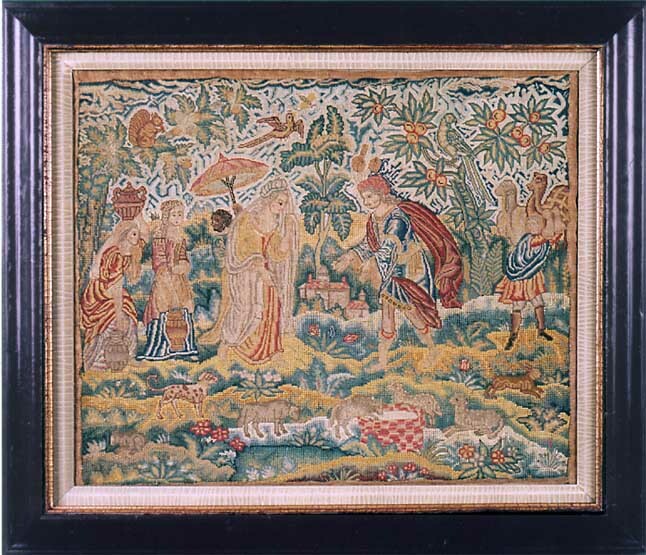 Finely worked tent stich embroidery depicting the biblical story of the triumphant return from battle by Jeptha greeted by his daughter. Worked with polychrome silks, metallic thread and crinkled silk. 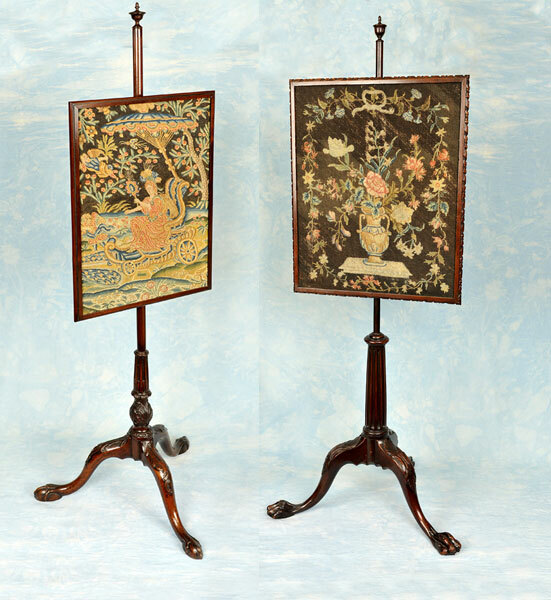 From the early 18th century to the mid 19th century pole screens were an essential item of furnishing in the English house. The rooms, often cold and draughty were heated by blazing fires. To protect the complexion from such heat adjustable pole screens became popular and supported on a tripod base they became a vehicle for the cabinet maker to show his carving skills and the needle-woman her art. Unfinished Embroidery Panel. English. Circa 1720. An outstanding large early 18th century panel in unfinished state. The colours remain as true today as they were nearly 300 years ago. The central octagonal panel depicts the finding of Moses and is surrounded by a wide ebullient floral border. The well developed under drawing is very clearly defined and of a high professional standard. Eliezer was Abraham's servant and his meeting at the well with Rebekah was a popular needlework subject at the end of the seventeenth and beginning of the eighteenth century, both in raised work and tent stitch. English. Circa 1700. Framed size: 66 x 60 cm.